Decisions to align executive packages to objectives is not a new idea. However, to illustrate how some companies are seriously taking Sustainability, forward-thinking corporations are doing just that. In January 2014, more than 1600 global business leaders attended Davos 2014 World Economic Forum in Switzerland. The hot topic, ‘doing business the right way’. A kick-off panel introduced a new and radical strategy on executive packages and aligning efforts to Corporate Social Responsibility (CSR). Panel members included PepsiCo CEO Indra Nooyi and Pricewaterhouse chairman Dennis Nally, both are considered global leaders in promoting Sustainability. Today, some 269 company’s in the Standard and Poor’s 500 Index are considering implementing some Sustainability measures relating to environmental and social issues. Two examples are: Intel, computer chip maker maker, and Alcoa one of the largest producer of aluminum. Decisions, decisions, decisions – and they don’t stop with Sustainability. In fact, they place executives and executive decisions on the carpet each time they make financial corporate decisions. Although the complexity of the enterprise can be simplified, decision-making that considers more than financial consequences can put social and environmental levels in a tug of war – moving away from a financial centric decision to a Sustainability decision that reflects a holistic perspective. Most of today’s executives were indoctrinated under the economic doctrine of Dr. Milton Friedman. Friedman, who has argued that the primary responsibility of business is to make a profit for its owners, albeit while complying with the law. According to this view, the self-interested actions of millions of participants in free markets will, from a utilitarian perspective, lead to positive outcomes for society. If the operation of the free market cannot solve a social problem, it becomes the responsibility of government, not business, to address the issue. Friedman also argued against CSR. He believed that management is to make as much money as possible within the limits of the law and ethical customs. He argued that the primary responsibility of business is to make a profit for its owners, albeit while complying with the law. According to Friedman, an agency theory perspective implies that CSR was a misuse of corporate resources that would be better spent on valued-added internal projects or returned to shareholders. 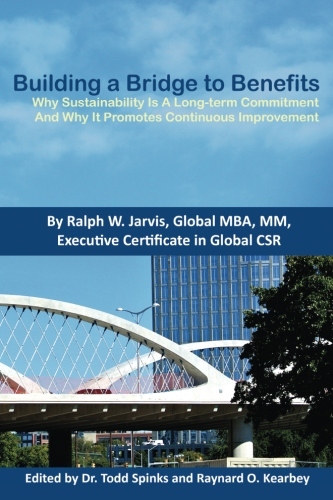 It also suggested that CSR was an executive perk, in the sense that managers use CSR to advance their careers or other personal agendas. If the operation of the free market cannot solve a social problem, it becomes the responsibility of government, not business, to address the issue. So why would any executive or owner want to take a journey that could be more complex, filled with harder decisions, juggle the tensions between stakeholders and shareholders and for what? I think Ray Anderson said it best; “And I have not mentioned the value of a tree and removing carbon dioxide, a greenhouse gas, from the atmosphere, sequestering carbon, and producing oxygen for us to breathe, nor the songs of birds that are heard no more where the forests used to be. Neither have I mentioned the disease spreading insects that now proliferate unchecked because of the birds, their predators are gone, resulting in an increase in encephalitis in the children of the region. So you see, there are serious questions to be raised about the traditional calculation a profit on the sale of timber harvested from clear-cut forest.” So, we are all products of our decisions and Sustainability is a commitment to do the right thing. Change is often called the “business constant”. For change in the marketplace, the government, regulations, Customer needs and wants, various forms of technology, even the issues of land, water and air are variables that influence business and your enterprise. So, I agree whole heartedly with Mr. Kelleher and Mr. Kelly.